Graduation was wonderful (other than standing for way too long in a pair of high heels), and now I am reveling in official summertime joy. The weather seems to have finally given up its temperamental springtime nature, and I think we can rely on sunshine now. The warm weather and long days always seep into my cooking, pushing me away from stews and anything that involves a long simmer and into the territory of quick-fixes, cool dishes, and generally anything bright and colorful. 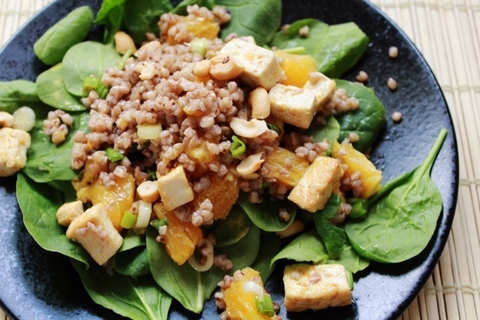 We’re riding out the last wave of oranges up here, and I’ve been trying to branch out on my grains lately, so this little salad was an attempt to combine the two. 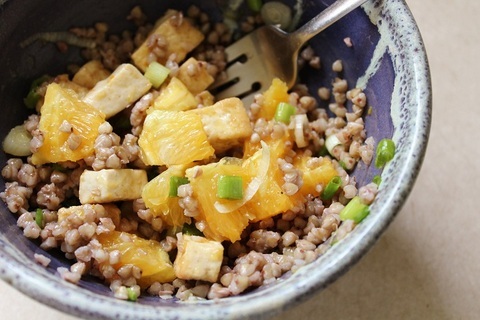 I haven’t used buckwheat much before, and, in all honesty, I think next time I make this I’ll go for farro or brown rice, but it was nice to break things up a bit. I liked the combination of flavors and textures here, and the bright, super-sweet orange is a lovely contrast to the salty soy sauce and crunchy cashews. I also think the tofu cubes are pretty essential, but, then again, I love fried tofu. If you don’t, you can easily omit it, although it will be more of a side dish at that point, instead of a full meal, which is what I’m usually aiming for in this kind of dish. Special Diets & Allergies: Despite its name, buckwheat actually is not a form of wheat, or related to it in anyway. Oddly enough, its closest relations are actually sorrel, rhubarb, and knotweed, whatever that is. From what I understand, it contains no gluten, so it can be eaten by people with wheat sensitivities or Celiac disease. This dish is also dairy free, vegan, and vegetarian. Veg Meal with Meat Option: You could certainly serve this with cubed chicken instead of tofu, or do do custom plates for different diners’ preferences. This healthy salad is flavorful and filling, and a complete meal. 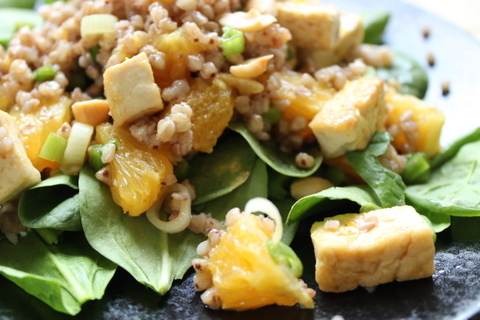 The chewy, salty tofu pairs nicely with the Asian dressing, sweet orange slices, and crunchy cashews. Meanwhile, heat 1 T of the olive oil in a medium-sized saucepan over medium-high heat. Add the buckwheat groats and toast, stirring frequently, for 2-3 minutes or until fragrant. Add the water and salt, stir, cover, and raise the heat to high. Bring to boiling, then reduce the heat to low. COok for 15 minutes, or until all the water is absorbed. Remove from heat and let sit for at least 10 minutes. Fluff with a fork. 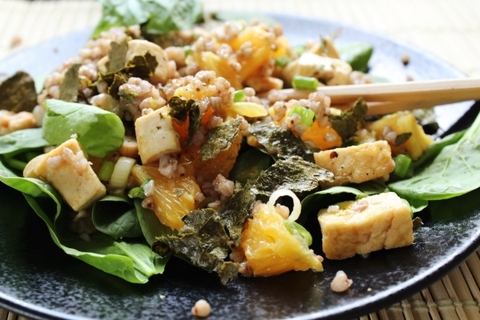 While the buckwheat is cooking and the tofu is draining, make the dressing. Whisk all of the ingredients together and set aside. Then toast the nori: Place one sheet in a small skillet and turn the heat to medium high. Toast the nori until it begins to turn golden and curl at the edges, flip it and toast another 30 seconds or so, being careful not to let it burn. Remove from the pan and repeat with the other sheets. Once the nori is cool enough to handle, crumble it into small pieces. Next, chop the tofu into small 1/2″ cubes and salt them liberally. Heat the remaining 2 T of olive oil in a large skillet over medium heat. Place the cubes in the hot oil and cook, rotating occasionally, until all of the sides are golden brown. Remove with a slotted spoon and blot with paper towels if desired. 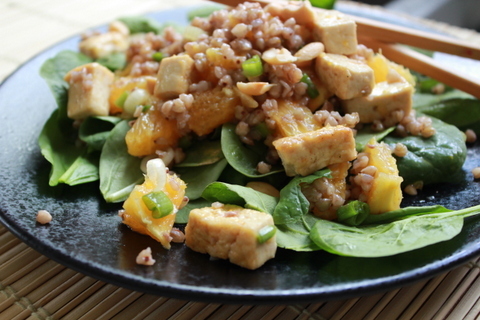 Once the buckwheat is done and properly fluffed, combine the buckwheat, tofu, and oranges. Toss half of the dressing with the buckwheat mixture. To serve, place about 2 C of spinach on each plate. Divide the buckwheat mixture between the plates and top with the cashews, scallions, and crumbled nori. That looks really good and I love the sound of the sauce! I’ve never had buckwheat before but have been meaning to try it. 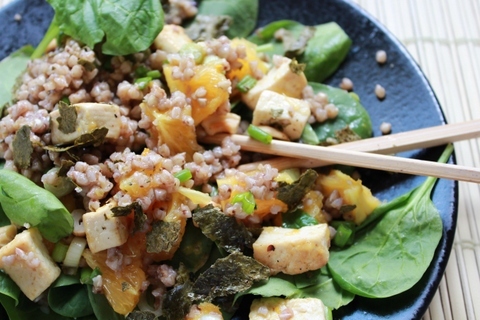 I liked the buckwheat, but I think this would be good or maybe be even better with quinoa, farro, or just rice. I think I might try buckwheat in a breakfast dish, too. Let me know if you find any good uses for it. This sounds lovely. I do love buckwheat. I soak a handful of buckwheat and a handful of sunflower seeds overnight in water, rinse in the am and add a splash of almond milk, some coconut, maybe some raisins, cinnamon – makes a satisfying and tasty breakfast. I look forward to trying this salad!